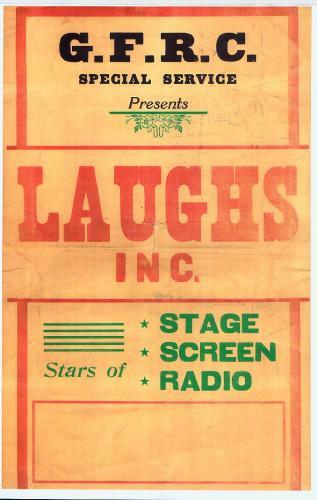 The Story of "LAUGHS, INC."
The story of Laughs, Inc. is not specific to Camp Croft. In fact, the unit never played to a stateside audience at any US Army installation. But many of the men that made up this very special group of talented musicians, singers, comedians, dancers, and other performers came from basic training camps like Croft. Most were draftees or "selectees" brought into service through the Selective Service Act who soon found themselves overseas in combat and support units. The story of how these men used their talents to entertain their fellow soldiers in the European Theater is presented here as told by two veterans of WWII and proud former members of Laughs, Inc.